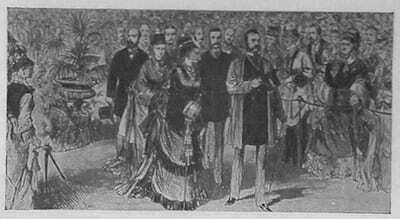 But if British views of Russians at the Great Exhibition simply reflected contemporary events and attitudes, within Russian literature the Crystal Palace assumed a particular significance, as it became a touchstone for debates about modernity, westernization and social transformation. Reports in the Russian periodical press throughout the exhibition itself indicate the level of interest in events in London (see my website for reports from one of the major radical journals, The Contemporary), but it was somewhat later, after the Crystal Palace was dismantled and rebuilt on Sydenham Hill in South London, that it acquired this additional dimension, when it became the subject of a famous dispute between Dostoevsky and his main radical opponent, Nikolai Chernyshevsky, the effective founder of Nihilism as an intellectual (not as a bomb-throwing) movement. In July 1854, Chernyshevsky wrote a detailed and glowing review of the reopening of the Crystal Palace in the journal Fatherland Notes, describing it as ‘a miracle of art, beauty and splendour’, and claiming that ‘there has not been a single voice that would be raised against the Palace itself, against its idea and its execution’. 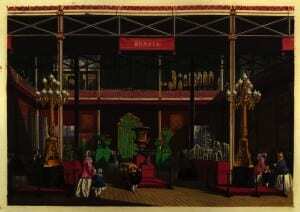 The Crystal Palace at Sydenham, by Delamotte. A building, a huge, huge building, such as only exists in a few of the biggest capitals — or rather, no, there’s no other building like it! … But this building — what on earth is it? What style of architecture? There’s nothing like it now; no, there is already one that hints at it – the palace that stands on Sydenham Hill: cast iron and glass, glass and cast iron — nothing else. Dostoevsky pursues the humorous side of this topic in his satirical short story ‘The Crocodile’ (1865), a merciless parody of the Russian fashion for progressive western ideas set in the ‘Passazh’, an iron and glass arcade off Nevsky Prospekt in St Petersburg that echoes the Crystal Palace. But the full dystopian implications of his critique are elaborated in Evgeny Zamiatin’s novel We (1921), in which the inhabitants of the ‘One State’ live their rational, useful and ordered lives in full public view in a glass city. Here, the utilitarian foundations of Chernyshevsky’s utopian vision elide with another of Jeremy Bentham’s most famous ideas: the panopticon, the construction enabling total surveillance that transforms the Crystal Palace from a mode of seeing to a mode of being seen. So long as they [the Proles] continued to work and breed, their other activities were without importance. Left to themselves, like cattle turned loose upon the plains of Argentina, they had reverted to a style of life that appeared to be natural to them, a sort of ancestral pattern…Heavy physical work, the care of home and children, petty quarrels with neighbours, films, football, beer and above all, gambling filled up the horizon of their minds. To keep them in control was not difficult. Football has long been considered the opium of the people (it was used as a means of control in Franco’s Spain, for instance). So Dostoevsky was right, it seems. If he were writing The Brothers Karamazov today, would the enslaved masses be in thrall not to the Grand Inquisitor and Christ moulded in his image, but to the likes of Sir Alex Ferguson and David Beckham? Maybe. 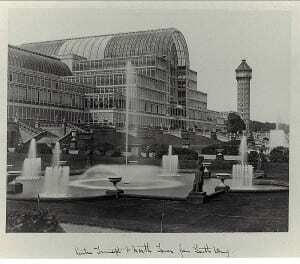 But perhaps the ball would break one of the windows of the Crystal Palace and challenge that universal ideal. Sarah J. Young is a lecturer in Russian at UCL SSEES. She researches Dostoevsky, the Petersburg text, 19th century Russian radicals in London, and Gulag narratives. She developed a particular interest in the image of the Crystal Palace in Russian literature and beyond after moving to London SE19. She blogs at sarahjyoung.com.